Preheat the oven to 350 degrees F. Prepare the pumpkin cutting in half, seeding, and placing in a roasting pan. Cook in the oven for one hour. Remove the pumpkin from the oven and separate the flesh from the skin. Place the flesh in a mixing bowl and set aside to cool. Next, pass the pumpkin through a potato masher and drain some of the extra moisture by placing the pumpkin flesh in a paper towel-lined colander. Allow the excess liquid to drain for 5 minutes. Pumpkin puree may be prepared up to two days in advance. To make the pumpkin gnocchi, measure out 1/2 cup of pumpkin puree. Place pumpkin, ricotta, flour, parmesan, egg, salt, pepper, and nutmeg in a mixing bowl. Mix well with a wooden spoon. Dust work surface with flour, place dough on work surface, sprinkle with flour, and mold into a log shape. Cut dough into 6 pieces and roll pieces into a rope. Cut the ropes into small cylindrical pieces. Set aside. In a large pot, bring salted water to a boil. Add the gnocchi and cook for 1 minute or until gnocchi rises to the surface. Remove gnocchi with a slotted spoon, place on a plate, and set aside. In a large skillet, melt butter over medium high heat, add thyme stems and vanilla bean seeds. Cook until butter just begins to brown then add gnocchi and heat through. 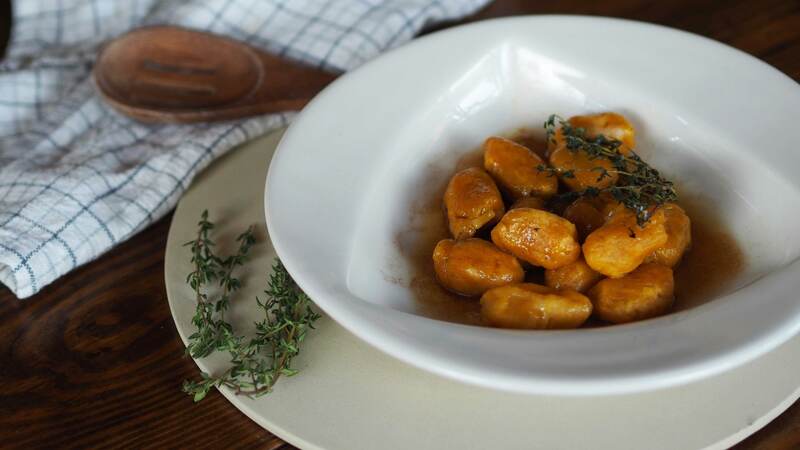 Plate and serve gnocchi with butter sauce immediately.